In most sports competitions, the winner (or winners) get a trophy of some sort. In baseball and football, the players get a championship ring and in hockey, the players hoist the Stanley Cup. But what do you do in thoroughbred horse racing when you have to award a horse who wins? Sure, you can give a trophy to the owner, the trainer and the jockey, but what about the horse, which does most of the work during the race (with all due respect to the jockey)? What do they receive for winning? They might prefer all the grass they can eat, maybe some hay and if their owners want to spoil them (which they usually do after a big race), all the carrots they can handle. But those special Kentucky Derby contenders that manage to triumph will get the venerable garland of roses that goes around their neck. This is a special honor that is yet another one of the long-standing traditions associated with “The Most Exciting Two Minutes in Sports”. If you’re betting on Kentucky Derby, you might also hear the race referred to as the “Run for the Roses” and now you’ll know why. Where Did the Garland of Roses Come From? The rose’s connection to the Kentucky Derby began in the late 1880’s – roughly around 1883. It was a man from New York, E Berry Wall who brought it to light. Wall was a well-to-do man who was the life of the party and as he was making the rounds, it just so happened that he was living it up at a post-Kentucky Derby event where Colonel M Lewis Clark was also present. The significance in that is that Col. Clark was the man that founded Churchill Downs and the Kentucky Derby. He saw Wall give roses to the women at the party and Col. Clark was quite captivated. He was so impressed that he set out to make the rose the official flower of the Kentucky Derby. However, the winning horse of the Derby was not adorned by roses until at least 1896 when Ben Brush wore a pink and white arrangement. The rose was made official for the Derby in 1904 when Elwood was the winning thoroughbred. The race was given the nickname, “The Run for the Roses”, in 1925 by Bill Corum, who was a writer for the New York Evening Journal and the New York Journal-American. Corum’s love for the Kentucky Derby can’t be denied as he not only came up with “The Run for the Roses” but he was also the president of Churchill Downs for nine years. He was the president when the Kentucky Derby was run on television for the first time in 1952. The phrase would later be turned into a song by Don Fogelberg in 1982. The garland (you may hear it referred to as a bouquet) you see now was created by Kingsley Walker Florist in 1932, when the horse that beat the Kentucky Derby odds and won was Burgoo King. This shop was responsible for the garland until 1987 when it was taken over by Kroger, the second-largest general retail chain in the United States behind Wal-Mart. 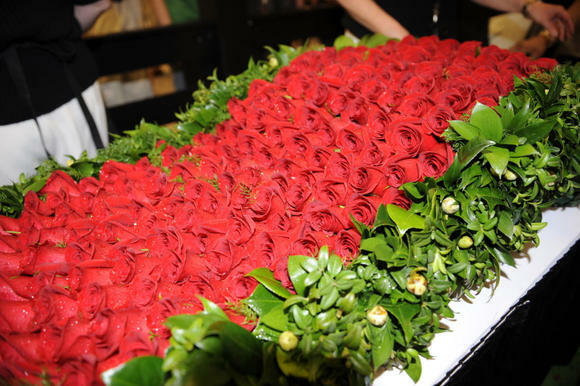 There is anywhere between 420 and 560 roses needed to create the garland that will be draped around the neck of the winning horse and it takes about 70 people to put it together. The creation of the garland is now a public event and thousands come to see it made, usually the week of the Kentucky Derby. If you’d like to do more than just check out the kentucky derby odds and take in the experience, joining this public event is a real treat. The garland is between two and three yards in length, about 12-15 inches in width and it weighs roughly 40 pounds. In the middle of the garland is a crown with a rose for each horse that lines up to take part in the Kentucky Derby. The winning jockey gets his own bouquet, which has about sixty roses in it with ten pounds of ribbon wrapped around it. Kentucky Derby betting fans know that the Run for the Roses is actually the baby of the Triple Crown races as the Preakness Stakes goes back to 1873, two years before the Derby, while the Belmont Stakes was first run in 1867. They all have very similar ways of rewarding the winning thoroughbreds, starting with the Preakness. The shortest of the Triple Crown races, the winning horse of the Preakness is draped with a garland of black-eyed Susans, which is the official flower of Maryland, where the race is run at Pimlico Race Course in Baltimore. Actually, it is a bouquet of yellow flowers which are coated in black lacquer to make it look like a black-eyed Susans but the sentiment remains the same. In addition, the silks worn by the winning horse and jockey are painted on a miniature horse/jockey combination on the weather vane that sits upon the Old Clubhouse, which has been around since Pimlico was opened in 1870. Finally, the winning owner receives the Woodland Vase, or rather, a replica as the original is in the Baltimore Museum of Art. The Belmont takes place at Belmont Park in Elmont, New York (Nassau County, to be exact), and it is the longest of the Triple Crown races. It truly earns its nickname of the “Test of the Champion”. The winning horse at the Belmont gets a garland of white carnations, which is why you will also hear it called the “Run for the Carnations”. The blanket is said to contain 300 to 700 carnations, depending on who you talk to. Meanwhile, the winning owner receives the August Belmont Memorial Cup, which is a trophy named after the man who financed the creation of Belmont Park. The trophy, which like the Woodland Vase is made by Tiffany’s, is kept by the winning owner for a year. A smaller version of the trophy is given to the owner as well as the winning jockey and trainer. The horse probably wouldn’t have much use for it.